Welcome. My name is Allison Merkle Alison, author of Parenting at Our Best. I’m so happy to have you as a visitor to my blog about my new book. This project is very special to me, and I hope to share some of that excitement with you here. I am hoping my blog can open the discussion about the amazing but difficult job of parenting. 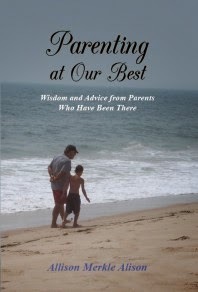 I would like to have an online community that can help parents and give sound advice from parents who have been there. Let’s get talking.